For those of us who chose to have more than one kid, have you ever thought of how life would be if you had only one? You would have so much more time for him/her, you don't have to feel guilty about loving one of them more than the other, you don't feel bad for tending to one and neglecting the other, you don't suffer from parenting woes related to sibling rivalry, and you understand how less can be more at times. This is coming from me, someone who has been a mum of one for three years, mum of two for another three years, and then now a mum of three. No, I don't regret having more kids because that is what I've always wanted and truth be told, if I had eight hands and legs, I would wanna raise a football team of kids and take care of them all on my own. However, for now, having three of them and being a stay-home mum is enough to keep me busy every minute, every second of the day. Yes, it gets hard even to breathe at times. You see, life at home hasn't been all smooth-sailing in the past few months. But then again, when has parenthood ever been a smooth journey? It seems like no matter how experienced I become at being a parent, each day still presents an unique set of challenges and even if I conquer them today, with tomorrow comes another set of hurdles to cross. 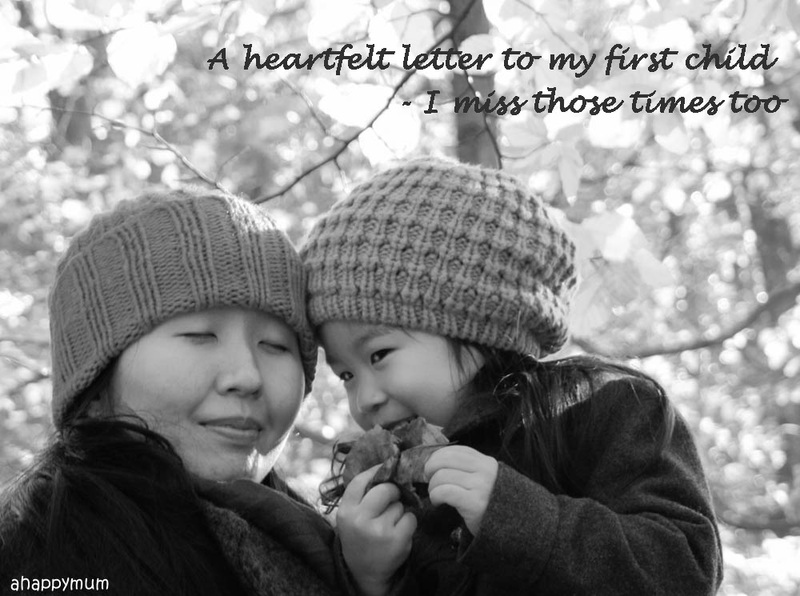 Here's a letter I penned for my firstborn, whom I've been going through a roller coaster ride with this year. Yup, we've had our fair share of ups and downs. I'm not sure if it's her way of trying to exert more independence now that she is in primary school, if it's her way of acting out to get my attention over her younger sister and brother, if she is tired of all the expectations people lay on her just because she is the eldest, or if it is just part and parcel of growing up. There were times when I felt like the worst mum, when I said things I shouldn't have said, did things I shouldn't have done and let motherhood bring out the worst of me. I know, my dear, I know how much you love me and how hard this is not just for me, but for you too. Here's a letter telling you how much I miss those times when it was just you and me, and how I will always love you, no matter what happens. I held your hand tightly as we waited in line for the Jurassic Park Rapids Adventure in Universal Studios. It was going to be your first time on the ride and since meimei hasn't reached the minimum height, you and I were going to ride on it alone while Daddy looked after her and didi. It's been long, so long, since I held your hand and never had to let go because of a younger sister who wanted my attention or a baby brother who demanded for his milk. It made me realise how much I missed it, and I'm sure you do too. We saw some other people putting on ponchos and you spotted a signboard that read "You will get wet!" But no, we did not worry about it and instead, we thought it might be quite fun to get wet together. Just you and me. Once we got onto the raft, the adrenaline kicked in and we were both getting ecstatic. But no, not once did I let go of your hand, not even for a split second. As our raft bumped along the rapids and water started flowing inside and wetting our shoes, we raised our feet and squealed together. When the dinosaurs squirted water on our heads and sometimes even our faces, we laughed in joy and tried to anticipate for the next one. Then we entered a long tunnel which was so dark that I couldn't see your face or my own fingers. I put my arm around you because I knew how scared of the dark you are, assured you that everything would be all right and told you not to be scared because I was there with you every step of the way. We boarded a lift that took us upwards and that was when you saw the head of a giant T-rex and got a scare. You squeezed my hand and jumped, which in turn gave a me a fright too but I held onto you even more tightly and braced ourselves for what was to come - the final drop. Not surprisingly, the drop didn't scare you at all. No, you are one who dreads the dark but isn't scared of roller coasters and vikings. In fact, you dig the adrenaline rush and always wanna have the best seats in the house - first row for roller coasters and last row for viking, and you would ask to go on the same thrilling ride over and over again. So, we screamed (or was it just me who screamed?) but we also chuckled and enjoyed the last part of the ride. I loved it because I was with you, you know that? The truth is, my dear, I know you miss those times when you had me all to yourself, when it was just you and me against the world, when I had only one child and that was you. And you know what, I miss those times too. Even if I don't say it out loud, I do think about it from time to time because those years were wonderful years spent with you, my firstborn. 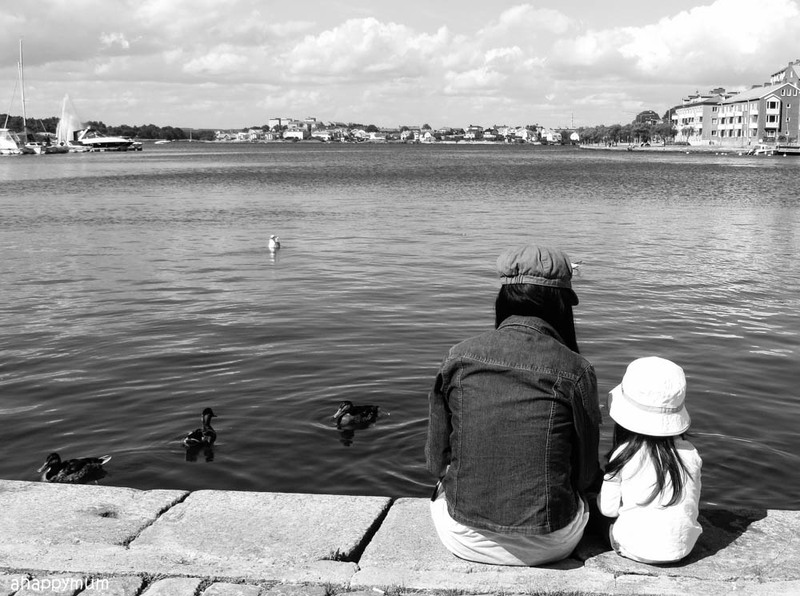 That was the time when we were living in Sweden, when you and I would go for walks nearly every day, when we would sit by the lake and feed the swans and ducks, when life was quieter and more peaceful, when we would hold hands or I would carry you, piggyback you or push you in your stroller whenever we went. We had all the time in the world to ourselves, especially when Daddy was sailing or busy working, it was just you and me, day in day out. You chased away my loneliness and gave me a reason to wake up each day. Your cute, smiley face was what greeted me every morning and there just seemed so much good in the world and so many amazing things waiting for me. You made me realise how motherhood was the best thing that ever happened to me and it seemed like I was given a fresh new start in life and it didn't matter what past mistakes I had made, I had a new opportunity to live right and to do right by you, my child. Those were the days when I could attend to your every whine, even though I don't give in to you when you were being too unreasonable (and I still don't, you know). Those were the days when bedtime storytelling was just about you and me, and you could sit on my lap or snuggle in my chest the whole time. Those were the days when mealtimes were more peaceful and we could always sit side by side. Those were the days when we could go on holidays as a family of three and you were the only little one in our family portraits. You were my pride, my joy, my reason to live. And you know what, you still are. Many people told me about how the first child will get jealous when the second one comes along and will act out, throw tantrums or even push the sibling away. In fact, one of my friends was rather unable to breastfeed her second child because the first one would come over every time, kick up a fuss and just make things difficult for everyone. When meimei arrived in this world and needed me to feed her every couple of hours, you would gently come over to take a look at her. Even during bedtime, when the three of us slept on the same bed, my back would be against you whenever I was feeding your sister who was lying on the other side. Do you remember what you said? I can never, ever forget that because you made me tear up. Those were tears of joy, of relief, yet of melancholy too. You told me in that sweet, patient voice of yours "Mummy, later after you finish feeding meimei, can you turn over and hug me?" That was when I knew, I just knew, that you were going to be the most awesome big sister. And you are, in every sense. Despite the fights and squabbles, I know how deeply you dote on your siblings with every beat of your heart and how you would go all out to protect them. 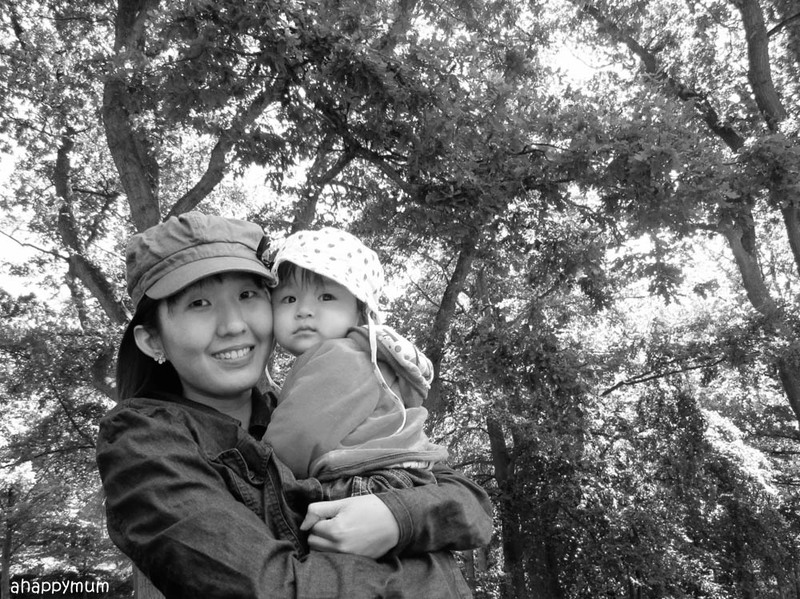 You are my sensible one and you are always my best helper - or what we call a mini mama. You dash to your baby brother at every whimper and seeing how he hugs and kisses you is proof that he adores and looks up to you. I know sometimes you give in to meimei not because you are wrong, but because you just try to make things right and make me less frustrated. I can hear the way you feel indignant at times and that you think you deserve more and deserve better from me. I feel your tight hugs when you return from school every day and I know the way you pout your lips for a goodnight kiss is a sign of how much you still crave for my attention and love. I know life isn't fair to you all the time and it can be tough trying to be a role model for your siblings. I know, my love, I know. It isn't easy being the eldest child but I also know how madly and deeply the three of you love one another. Having a sibling can be the best thing in life, you know that? My hope for you is that you will remain loving and close, always and forever, even when I'm not around and when you have each built your own lives. For now, while I may not be able to spend much one on one time with you, at least being a stay-home-mum allows me to spend every single day with all of you and you have no idea how much joy it brings me to be able to be by your side, watching you grow, watching you bloom. No matter how much time passes or how fast you grow up, you will still be a baby in my heart. My first child, my darling, my precious little one. I love you all the same and I will never, ever stop loving you. Let's look forward to the day when it would be just you and me again, and I promise I will take you to a book sale where you can lay your hands on your favourite books, or we can go shopping for earrings and get matchy matchy ones, or we can just spend a day at Universal Studios and go for ride after ride, just you and me. Just promise me we will scream together, okay? I am amazed that inspite the kids, you still have time to do all that you do. Hats off to the energy and the channelising of energy. Loved the chimes you did for National Day, which I will imitate. There is a proverb," imitation is the sincerest form of flattery."